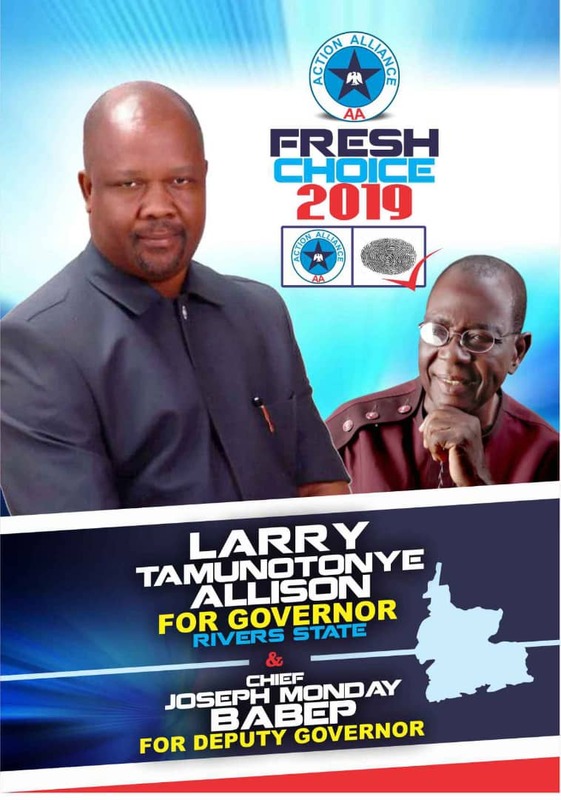 The "Fresh Choice" mandate of Rivers State Action Alliance Candidate, Mr. Larry Tamunotonye Alison and his Deputy, Chief Joseph Monday Babep, have continued to gain massive preferences and acceptance across communities in the state. 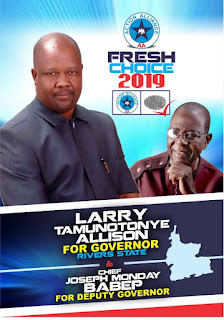 As we countdown to Rivers State 2019 governorship elections on the 2nd of March, the campaign train of Larry Tamunotonye is moving tirelessly to ensure that provisional emphasis are made to target youth empowerment, social development, ICT innovations, education, power, agriculture, rural development and revolution, resource management and government restructuring. The Action Alliance Candidate has called on the people of Rivers state to shun vote buying or accept manipulations from politicians and political party's aspirants. Mr. Larry tells youths of Rivers state to rely on his ability of a leadership that understands, such which is concerned about building a new Rivers State through development, transformation and exposure. He mandated the people to refuse intimidations and threats from other candidates but should instead come out en-masse to vote and protect their franchise. He stressed that their future is in their hands and they can decide it for themselves. He also congratulated youths across all local government areas for their advertent support and believe in the"Fresh Choice", which the Actions Alliance led government will deliver when elected on the 2nd of March.